Note: This is a kettle dyed yarn, so the skeins vary a lot within the same bag. Also, colors are shades of the colors shown. The hat shown here takes 1 ball. 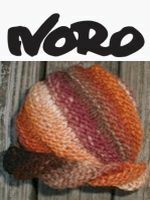 The pattern for this hat is available free with a purchase of Azapa yarn. Display books & patterns featuring Azapa.